Alastair Heim has a new book, THE GREAT PUPPY INVASION and he has agreed to give away a copy to one lucky winner. All you have to do to get in the running is to leave a comment. Reblog, tweet, or talk about it on Facebook with a link and you will get additional chances to win. Just let me know the other things you did to share the good news, so I can put in the right amount of tickets in my basket for you. Check back to discover the winner. The idea for THE GREAT PUPPY INVASION actually came from a piece of art located where I work. The sculpture is of five Dalmatian puppies standing “cheerleader pyramid style” on top of each other. When I first saw the piece, a few questions popped into my brain: Why would a bunch of puppies stand on top of each other like that? Maybe there’s not enough room for all of them? Why isn’t there enough room for all of them? And that’s when the idea hit me like lightening: Hundreds of puppies suddenly show up in a town that has never seen puppies before. The following weekend, I began writing the manuscript. The first thing I had to do was think of the name for a town that has never seen puppies before. A town where fun was forbidden. A town where play was prohibited. A town where cuteness was downright criminal. There’s only one name for a town like that…Strictville. Now that I had a location, it was time to write the story. One of the first things that really made me giggle after I dove into the narrative was just how ridiculous puppy behavior is, when you actually stop and think about it – ESPECIALLY if you’ve never experienced it before. Puppies are extremely friendly, they love to be chased and they wag their tails when they’re happy…things like that. I tried to weave in as many wonderful puppy characteristics as possible throughout the story and one of my favorite parts of the book, in fact, happens toward the beginning. The mayor orders the townspeople to try everything they can to rid themselves of the puppies. The townspeople throw sticks at them…but the puppies bring the sticks right back. In my original draft, the story was simply about the town’s reaction to the puppies arriving – there was no main protagonist. Luckily, I decided to take the manuscript into my trusty critique group and one of the first pieces of feedback I received was, “This story needs a character with a name.” It was such an obvious miss, that I was a bit embarrassed I hadn’t thought to include one. One the drive home, the name “Little Teddy” popped into my brain and, thus, the story became his. A few weeks after I had finished the manuscript, my agent, Kelly Sonnack, received an email from my editor at Houghton Mifflin Harcourt, asking if I had any new stories ready for her to look at – which is every new author’s dream. The timing was perfect! Kelly sent the manuscript off and she replied a few weeks later with an offer. The amazingly talented Kim Smith, who is also one of Kelly’s clients, was chosen to illustrate the book and she really knocked the cuteness out of the park. I am incredibly proud of how this book turned out. Since its release in October, I have been absolutely delighted and humbled by the response from readers. I sincerely hope children everywhere (and their parents) love reading it over and over again. 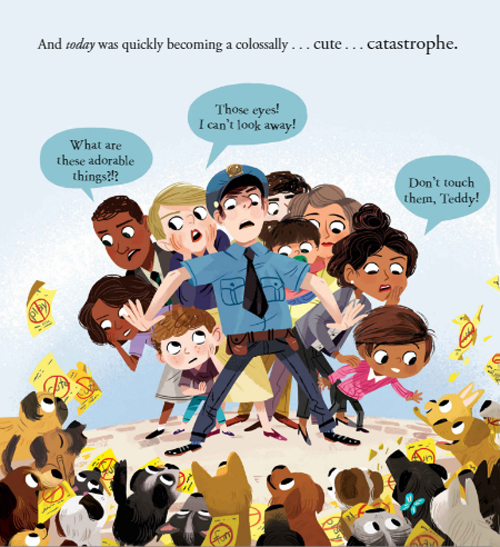 It’s filled with humor, suspense and an incredible amount of adorableness. There’s also a sweet little surprise at the end that hints at even more possible cute mayhem to come. I am forever grateful I saw that sculpture. Alastair Heim writes children’s picture books. He lives in Missouri with his awesomely, awesome family who inspires him everyday. Laughter is his favorite sound, purple is his favorite color, and other-people-cooking-for-him is his favorite food. He is a huge fan of music and has been known to play the guitar with impeccable mediocrity. Remember: Alastair is a Writing With The Stars mentor – Don’t miss out. Thank you Alastair for sharing your book and its journey with us. Look like so much fun. I am sure it will find a welcoming home. Cute! The best invasion is a puppy invasion. This sounds like such a cool book. So original and poignant! Loved talking about this book in LA at the Kelly Soiree and to see it in print is even better. Congrats! Love the book! I already have a copy, but I still need one to give to my 3 month old niece! Congratulations on your success! ANOTHER great giveaway. Just shared on fb and twitter. My granddaughter would love this! This is a great book! My boys love it. Shared on FB and Twitter! I just checked this book out from the library. I would love to have a copy to keep! I love the humor of this book, and I found this interview illuminating. Cool “pro tip” from Alastair — try pinning down the location/setting before drafting as it can help inform the narrative. This book sounds so fun! I can’t wait to read it! We just got a new puppy and I can attest to the cuteness issue 100%. We try not to see it as a problem though. This looks like a fun book, I’m sure lots of kids will love it. I’ve tweeted a link to increase my chance of winning: https://twitter.com/carlrscott/status/942864616450691072. I’ve also pinned an image on Pinterest: https://twitter.com/carlrscott/status/942864616450691072. Thanks for the chance to win a copy, have a great week! It sounds very cute! And I love the illustrations! Can’t wait to read this book! It’s definitely on my list to buy for my nieces and nephews. Can’t wait to read this book! I tweeted this and put it on facebook. I’ve been dying to read this since I saw the art in a tweet! Cuteness factor X 2! Fun to read how you got this idea! What a delightful puppy tale! I just checked out this book from my local library and I look forward to reading it this week. It looks really cute! Reminds me of a related Storystorm idea I had!